A key concern in the work of director Takashi Miike is the notion of family. In many of his films, the desire for the kind of stability and security only found within the traditional family environment is what drives his characters to the absolute extremes of the narrative, and often into the criminal underworld where the family unity will be surrogated by violent gangs and Yakuza syndicates. We see this idea in many of his best films, like Rainy Dog (1997), Ley Lines (1999) and Agitator (2001); where characters without families band together and find moments of acceptance between the bouts of violence and retribution. In other films, we have the presentation of the family in a more traditional sense, albeit, with elements of violent dysfunction and inevitable disintegration for the basis of great satire. Here, we find pictures like Visitor Q (2001), The Happiness of the Katakuris (2001) and of course, the film in question. The presentation of family in Young Thugs: Nostalgia (1998) is less abstracted than many of Miike's other films; with the specifics of the time and place and the emphasis on the dynamics of the characters in relation to the overall plot giving us something that seems very special and unconventional by the director's usual standards set by films like Ichi the Killer (2001) and Dead or Alive (1999); with the combination of great, intelligent characterisations, strong performances and some absolutely impeccable direction. Although it is based on a novel, the film feels like a more personal project for Miike, with the depiction of small-town Osaka life and the late-1960's/early 1970's timeframe being very close to the filmmaker's own youth and experiences; with that sense of nostalgia, as alluded to in the film's sub-title, being more apparent in the fantastic evocation of a particular time and place within Japanese culture and society. Some viewers have drawn comparisons to an American film like Stand by Me (1986), which I suppose is apparent in terms of nostalgia itself and the presentation of the quest in which the central characters set out on an adventure that they think will change their lives and put everything into an adult perspective, but simply find the same old trials and tribulations, only in a different setting. For me, it was more reminiscent of the flashback sequences of Miike's later masterpiece, Dead or Alive 2: Birds (2000), which captures a similar evocation of childhood abstracted by the combined forces of memory and imagination, whilst also bringing to mind a film like Shunji Iwai's All About Lily Chou Chou (2001), which again, presents the idea of characters striving to escape from a very real sense of childhood dysfunction. Obviously, a film like Lily Chou Chou focuses on a much older collection of characters, and therefore covers different themes and preoccupations to those expressed herein. Nonetheless, there is a similarity in tone as well as presentation, not to mention the depiction of a rural environment that is both tranquil and oppressive in almost equal measures. Miike also uses the film to examine three generations of Japanese masculinity, similar to the structure of the characters in The Happiness of the Katakuris, with the son, father and grandfather all living in the same house, expressing different views and opinions and ultimately clashing in such a way as to show the differences (and ultimately, the similarities) of these three very interesting characters. It works because it captures a mood and an atmosphere that is just perfectly realised on almost every level; from the extraordinary direction of Miike - with its great use of colour and composition and fantastic soundtrack that really manages to underpin the time and place like nothing else imaginable - to the believable script and the naturalistic performances of the incredibly young cast of characters. Despite his reputation as a director of sadistic torture and sexual violence, a film like Young Thugs: Nostalgia, remind us of what a naturally gifted filmmaker Miike really is. For example, his direction of children and actors with limited experience is really second to none, as he manages to elicit a series of natural and believable performances that convey everything from comedy to drama, while still managing to balance this out with more experienced performances from seasoned actors, like the talented Naoto Takenaka. Also, his use of camera angles, movement and composition, structure and pacing are all fantastic throughout, and demonstrate that Miike is a filmmaker equal to Martin Scorsese; in the sense of documenting the seamy side of life (and the working-class environment of Osaka) in a way that is alive with energy and emotion. The balance between comedy and drama is completely subtle throughout, while a few scenes of childhood imagination and fantasy are allowed to erupt, quite literally, in a burst of vigour and excitement reminiscent of the 60's work of Jean Luc Godard. Some of the humour is admittedly quite earthy, while the film pulls no punches with its depiction of domestic abuse, childhood scrapes and the seedy underbelly of Osaka's strip clubs and gambling dens; though again, this is Miike refusing to pander to the adult-notions of childhood or the generally accepted tone that films about childhood should convey. Simply put, there are no rose-tinted reflections or apple-cheeked cherubs here, but rather, a rough and tumble attitude with elements of grit and off-colour humour, all tied to a wonderfully spirited atmosphere of excitement, colour and adventure that is evocative to say the least. 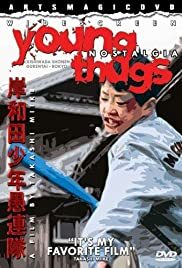 For this reason and more, Young Thugs: Nostalgia is one of the few great films about childhood, and one of Miike's very best and most compelling films to date.